My advice: don't get into the taxi before you have seen the meter and when it's not running ask him to put it on ......... or deal about the fare! If you want to take a taxi out of Kuala Lumpur to another state, go to the Puduraya Bus Terminal on Jalan Pudu (Level 2). City taxis are metered and yellow and black color or the new red and white color. Flag fall is RM 1.50 for the first two kilometers and 50 sen for every km there after. 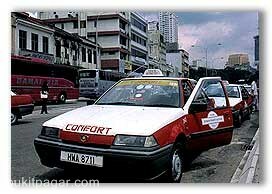 There is no extra cost for air-conditioned taxis, but there is a 50 % surcharge on the fare from midnight to 6 am. Your best bet is to get the bell boy of your hotel to call you a taxi. He will give you an idea what the fare will be. Note that this only applies in Kuala Lumpur. In the rest of the country you will find queues of taxis willing to take you most places, although the standard of driving is not perhaps suited to the timid of heart.